And of course the question marks in the heading are because no one really knows when the hill will be open no matter what may be planned. The whole thing of course is weather dependent and this means that in some seasons we have been open before the end of November and in others we have been struggling to get open for Christmas. The truth of the matter is that the Griz will decide when opening day is but that doesn't mean we can't speculate and start to get excited about the season before us. The top picture was taken a couple of days ago and shows the current state of Bear which is quite encouraging. 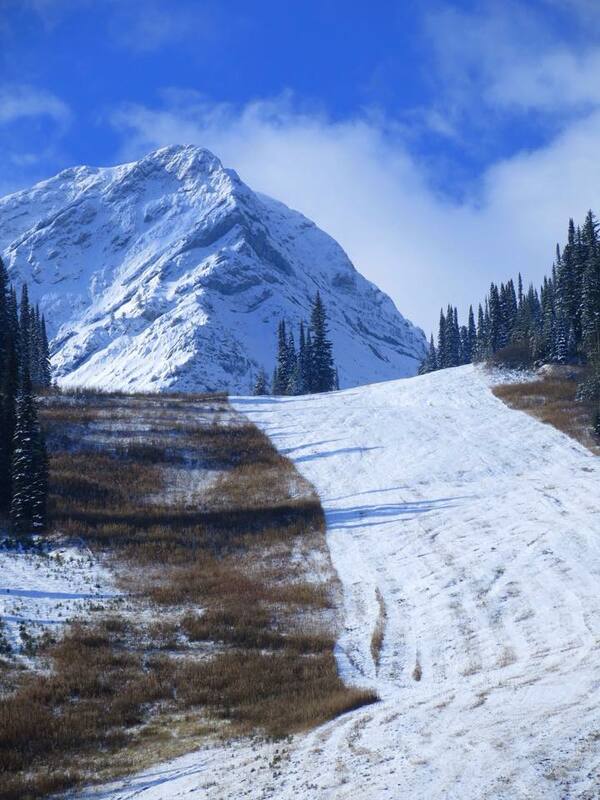 It looks like a fair bit if work has been done on it and the whole thing looks just about skiable although I don't think you would want to be on your brand new DPS Lotus Pures when you tried it. 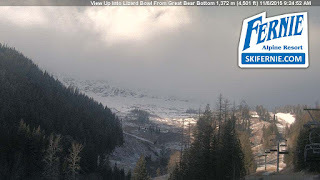 To put things in perspective the second picture is a screen grab I took from the mountain web cams yesterday - the white patch in the top right hand side of the pic is Bear. This shows that a lot of snow is needed to make the lower parts of Lizard bowl skiable although with careful farming of the snow and snow making on the lower hill anything is possible. 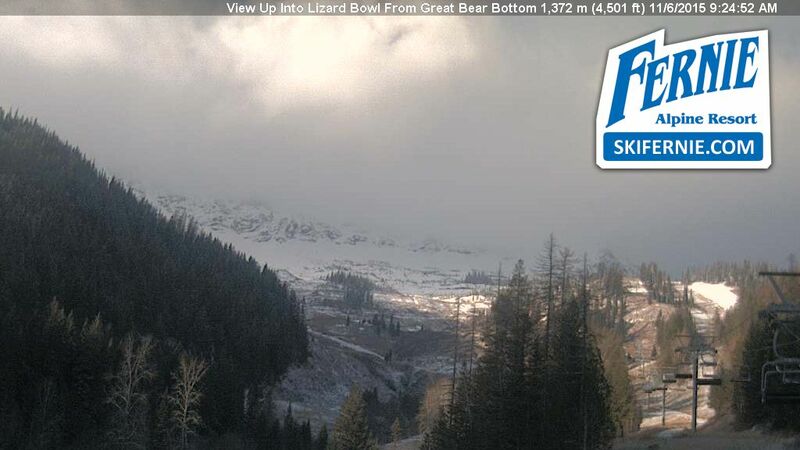 So there you have it the snow has started but more is need if we are going to have one of those epic November openings. My long term fears remain in that the El Nino conditions show no sign of subsiding and water temps in the Pacific remain at historic highs. That having been said we have had good El Nino years in the past just not that often. Just a tailpiece on the Air Canada flights from the UK. The best price I could get was £890 for Heathrow/Calgary/Cranbrook return. I noticed that the Frankfurt/Calgary/Cranbrook flight which was slightly longer cost £650. In the end I opted to spend a couple of days with my buddies in Ireland and fly out from Dublin as the Dublin/Heathrow/Calgary/Cranbrook flight (yes, that is exactly the same as the London flight but with a return leg to Dublin added) was £530. If you attach a notional cost of £50 for the Dublin return flights (and you won't find any going for anything like that price) it means that Air Canada are charging their UK customers and extra £410 to fly to Canada over and above what they charge their Irish customers. I wonder if anyone from Air Canada would like to comment on this price structure ?